Nations Press feature news How To Avoid Text Scams-Find Out Here! How To Avoid Text Scams-Find Out Here! SPONSORED LINKS There are a lot of people currently trying to scam people for load, for cash, and information. There is no way to safeguard yourself from these because in most cases they jot down random numbers or they use software that can message multiple numbers. The only protection you can have is your knowledge about it – the knowledge on how you can distinguish a real, relevant message from a shabby, scam. 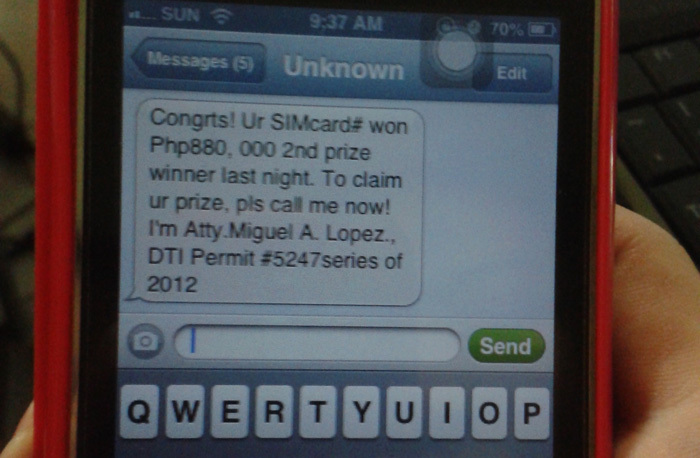 Text scams are growing and it has becoming a norm nowadays. These scams’ goal is to get something out of you without you being even aware of it. It may include them asking you for money, load credits, and even confidential information and it is your duty not to fall for it and to trash it immediately. Kidding aside, scams have become abundant and more and more people are falling for it so we listed tips here that can rid you off of those. Scammers think that using an attorney can fake their way out of your pockets. To tell you, lawyers or attorneys cannot have power in telecommunication companies unless they are owners. So if you ever come across a message saying that they are an attorney or they talked to an attorney and that they are demanding for something in return, just trash this message and move on. Do not get this wrong, there are instances that telecommunication companies offer freebies, promos, or discounts to its loyal and avid users but if it was sent from a regular prepaid or postpaid number, make sure you think twice. Oftentimes, providers will use their own names such as Smart, Globe, etc. to communicate with their users.Sometimes they will make you believe that you won a big amount so you have to type something in order to claim it. One of the main victims of these people are people who have relatives of loved ones overseas. One of the scams that became huge in the previous years are the ones who ask you for money or padala by means of load or cash. They will never second-thought their aim and they will continually ask you to send them cash or load because they need it. A lot of tactics used by scammers and the mention aboved are just few of it. Be aware and alert.